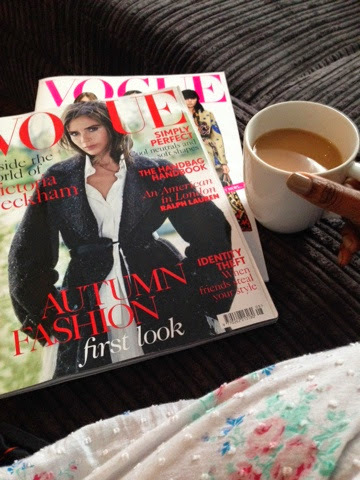 The Pursuit of Ivy George: The pursuit of...Vogue, Paris Couture and "Greige"
The pursuit of...Vogue, Paris Couture and "Greige"
Ahhh, sometimes you just need your pyjamas, a cup of tea and Vogue!! No, seriously that's how I felt yesterday after a long day at work, the sofa just looked sooo inviting! So after checking out the Autumn/Winter Paris couture shows online (my favourites so far are Armani Prive, Giambattista Valli and Chanel! - the Armani collection I've decided is very me!! Chic and tailored-so fabulous!) I painted my nails and relaxed reading about one of my favourite style icons, Victoria Beckham who has graced not only one but two Vogue covers this month! 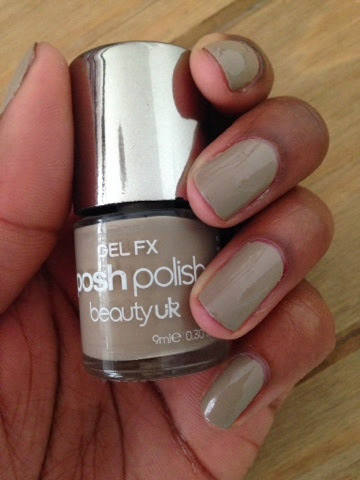 I painted my nails in this 'greige' colour by Beauty UK's Posh Polish collection. This colour from the GEL FX range is called "Cafe cosmos (greige)" and is a great neutral for all skin tones. As mentioned before in previous posts, gel effect polishes go on really well as they are highly pigmented so the coverage is usually flawless. True to its name it does give a high shine, gel manicure look which I am really pleased with. I only brought this on the off chance after seeing it in Superdrug a few weeks ago. I had not heard of this range before and was drawn to it because of it's appealing colour. It has great longevity and gives a nice contrast to the brights and pastels that are everywhere at the moment. Priced at under £5 each, they are a great steal! I'm going back online now to check out the rest of the Paris couture shows! - if you haven't seen any of the collections yet, check out: style.com and vogue.co.uk for great pictures and for who's on the front row! The pursuit of Blogging - My 100th Post and Giveaway!